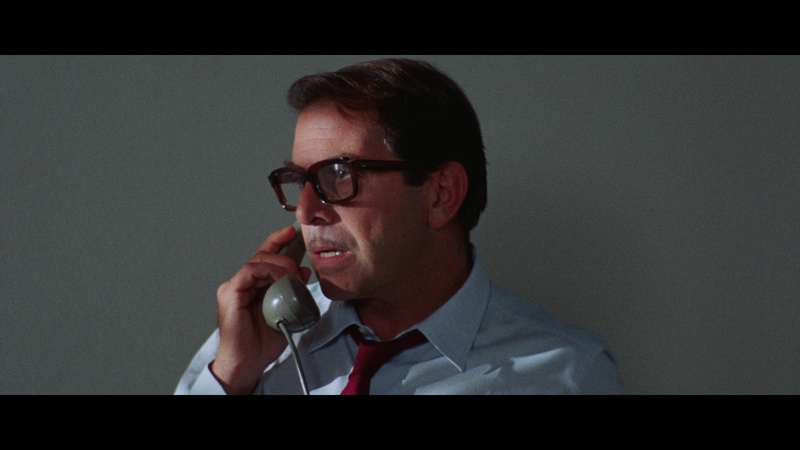 Color, 1970, 96 mins. 44 secs. 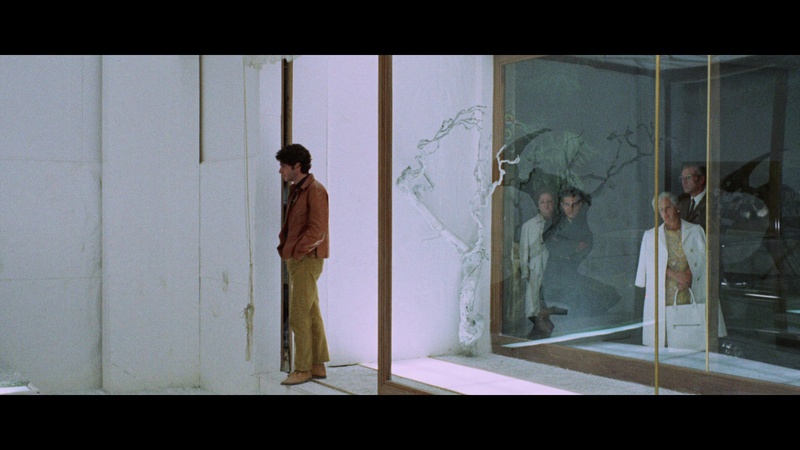 The streets of Rome first ran red with blood for many viewers with Dario Argento's directorial debut film and one of the most essential entries in the giallo craze of the '60s and '70s. Cannily featuring a vulnerable American hero and a British female love interest, the film was designed to appeal to an international audience while showcasing Argento's seemingly endless reservoir of visual and storytelling abilities. For the uninitiated, the film concerns an American writer, Sam (Musante), who has been staying in Rome with his girlfriend, Julia (Torso's Kendall). One night he witnesses a woman named Monica (Renzi) being attacked in an art gallery; the victim survives, and Sam is informed by the police that the assailant is a serial killer slashing his way through the city. 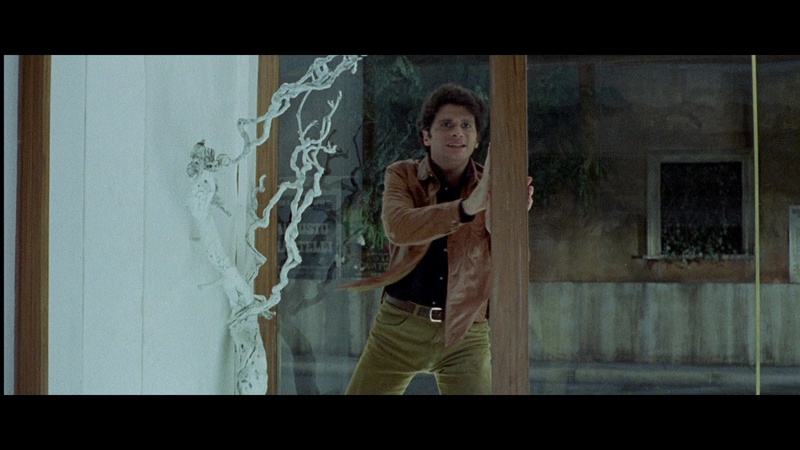 Sam feels that he has witnessed something that could lead him to the killer's identity, but he just can't put his finger on it (a narrative device repeated in Argento's Deep Red and Trauma). 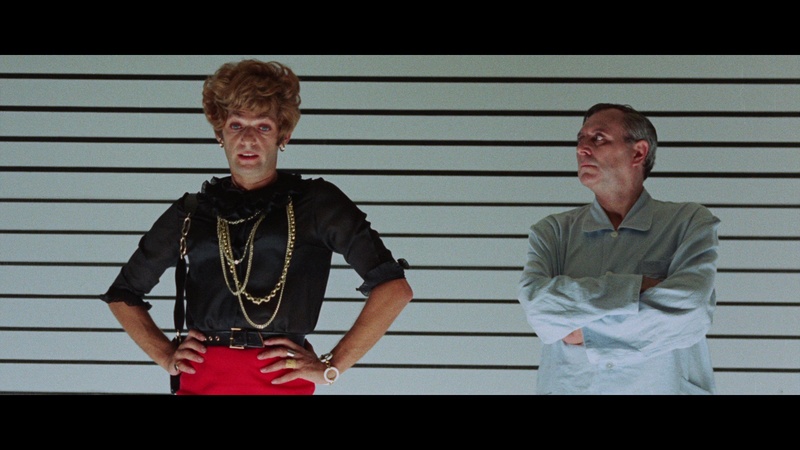 Thus, with some mostly involuntary influence from the police, he decides to stay in Rome and do some amateur sleuthing, leading to the expected terrifying results. Argento rarely had a stronger plot than this one, which anchors his trademark visual flourishes into a recognizable thematic and human fabric that would later be jettisoned for the candy-colored fantasias of Suspiria and Inferno. Ennio Morricone's groundbreaking, jittery score still manages to eke out every bit of suspense from the murder sequences, and the actors all do a fine job, partial dubbing notwithstanding. For once, the comic relief is actually pretty good, including an unforgettable encounter with an artist who keeps cats for a very unorthodox purpose. Significantly, the police procedural aspects are handled with surprising warmth and skill, never descending to the level of tedium which hobbles many other gialli from the same period. 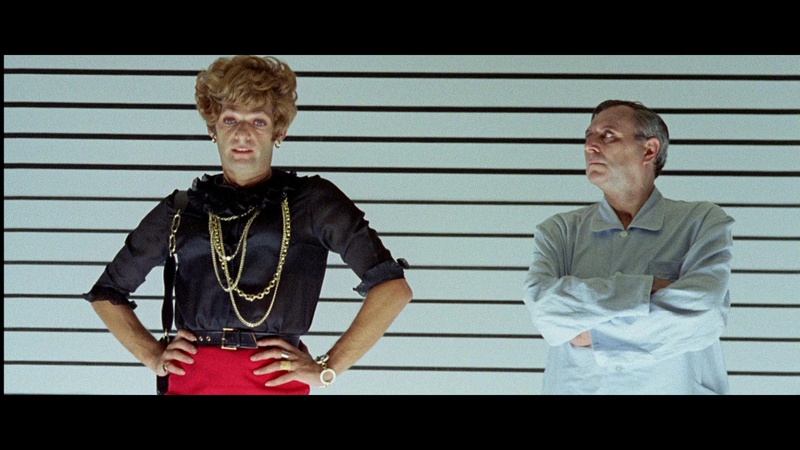 The film also firmly establishes the motifs which would continue throughout the rest of his major films, such as the deceptive nature of vision, a quirky gay supporting character who instills unease in the hero, and the distortion of characters' genders coupled with past traumas as a key to the mystery's solution. To say the least, Bird's history in theaters and on video has been very tattered. After reissues under the titles Phantom of Terror (via 21st Century) and The Gallery Murders, the film appeared on VHS in America from United/VCI and was concurrently issued by Columbia as a Japanese laserdisc. While the Japanese laserdisc looked more colorful and was uncut, it was only letterboxed at 1.85:1 and suffered from some distracting print damage. The washed-out Image/VCI laserdisc of the US print featured a more accurately letterboxed credit sequence but then opened up to an unsatisfying 1.90:1 ratio. The Roan Group released Bird completely uncut (featuring a glimpse of one victim's underwear being ripped off and some extra splattery slashing during the stairwell razor murder), while VCI first secured the complete European cut for American DVD, correctly letterboxed in an anamorphically enhanced transfer. However, this version still displays source damage and fudges its matrixed surround sound mix, with bumpy music transitions and a partial loss of the line, "Right, bring in the perverts." The extra gore was spliced in (rather badly in the first pressing) from a slightly darker, blurrier print (this glitch was corrected in a second pressing), and on 4:3 televisions, the letterboxing displays that same odd two-tone effect that plagued Anchor Bay's first 2-disc set of Halloween. Extras include the Morricone score also isolated as a kind of jukebox feature with each track separately labeled (though without the alternate cues present on the 1998 Cinevox reissue), apparently yanked from the American vinyl release based on the track titles and mediocre sound quality, as well as the psychedelic US first run trailer. The pointless UK DVD features a more horizontally compromised transfer (similar to the Japanese laser) in Italian with English subtitles and is even more badly censored than the US prints, losing all of the underwear mayhem and most of the razor slashing with some very rough edits. Extras include the Italian trailers for Deep Red, Bird, and The Cat o' Nine Tails, as well as English trailers for Demons and Demons 2, a stills gallery, and an odd overdubbed excerpt from the slapdash Dario Argento's World of Horror 3. 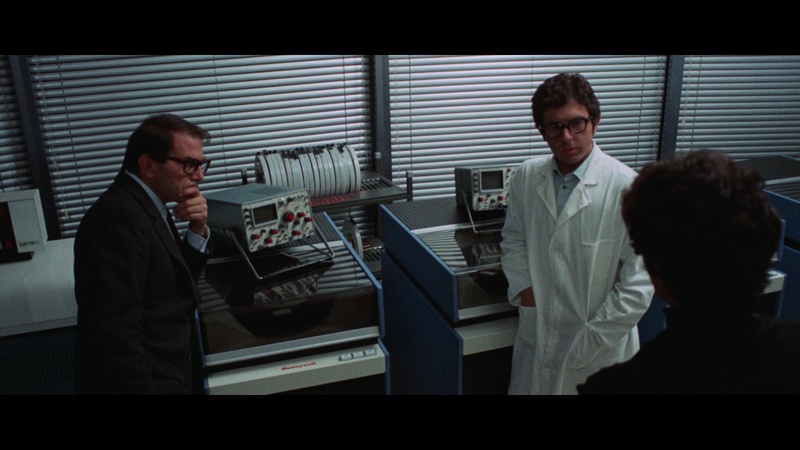 It was also available from France in an attractive anamorphic transfer, with French or Italian dialogue tracks. Then we have the Italian DVD from Medusa, which presents an improved transfer with richer colors and more spacious widescreen compositions, retaining more information on the sides. 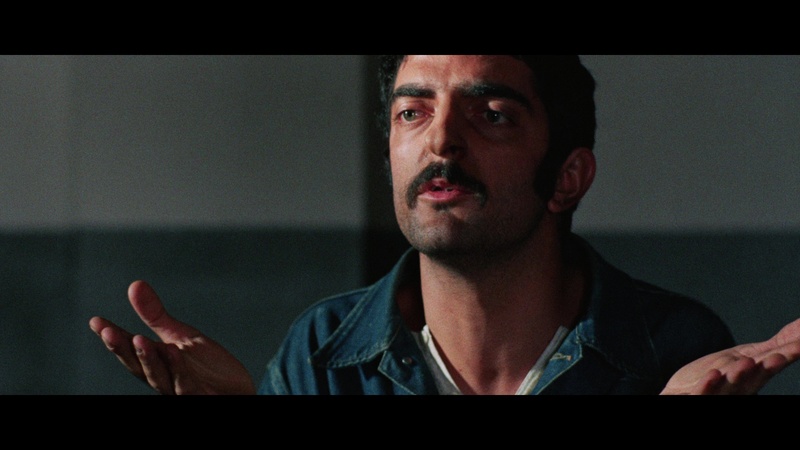 The Italian soundtrack can be played in the original mono or with a surprisingly aggressive, directional 5.1 mix, with English or Italian subtitles. 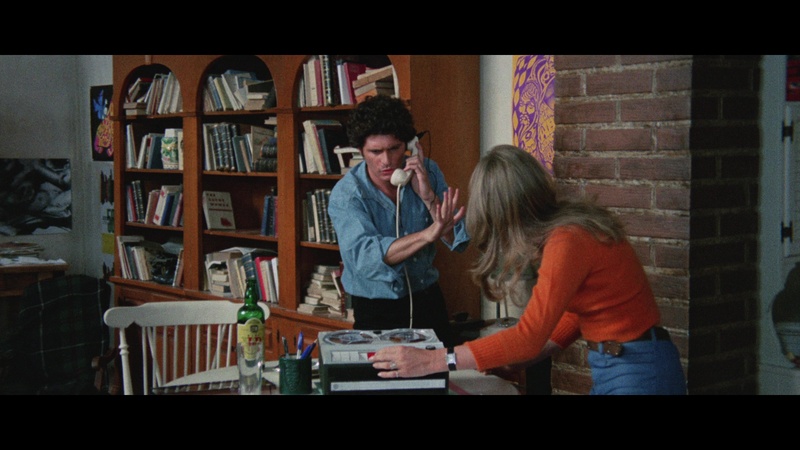 However, as with the Italian Tenebrae DVD, the 5.1 version also drops some crucial sound effects, such as a buzzing telephone that Musante now answers for no apparent reason. The mono English soundtrack is included as well (and seems to be lifted from the VCI disc but without the stereo effects); note that on some players, the English track can only be played with English or Italian subtitles activated. No extras. Salvation for Argento fans in the U.S. really arrived when Blue Underground licensed the film from VCI for a double-disc DVD edition in 2005 and a Blu-ray in 2008, featuring the same extras and sporting a refurbished, uncut HD master. (It also revealed some additional female flesh exposure in the first murder sequence that makes that PG rating a bit more questionable.) The English soundtrack (still missing the first bit of the "perverts" line) can be played in mono, Dolby Digital 5.1 EX, 6.1 DTS-ES, or Dolby surround (with a Dolby TrueHd 7.1 offering on the Blu-ray); the remix offers considerable more room among the speakers for Morricone's score but is noticeably more restrained than the Italian DVD, keeping dialogue and sound effects mostly grounded in the center channel. Fortunately this also means it's truer to the original mix and doesn't drop out anything crucial. 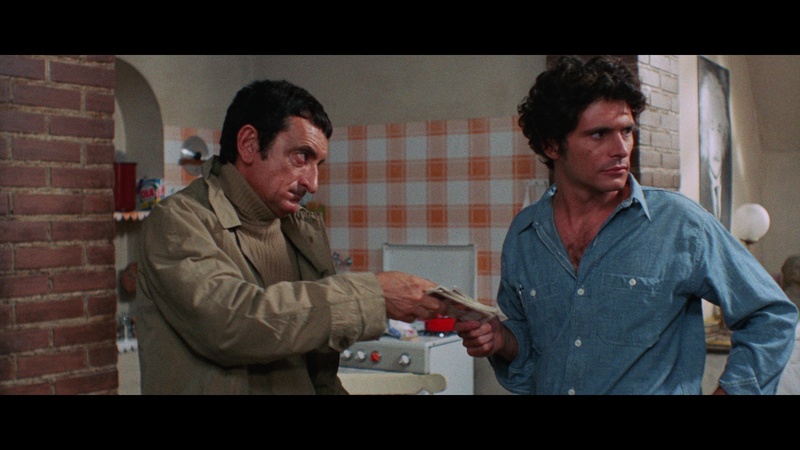 The Italian soundtrack (which doesn't come close to matching the actors' lip movements but is quite well done otherwise) can be played in 5.1 or mono, with optional yellow English subtitles. 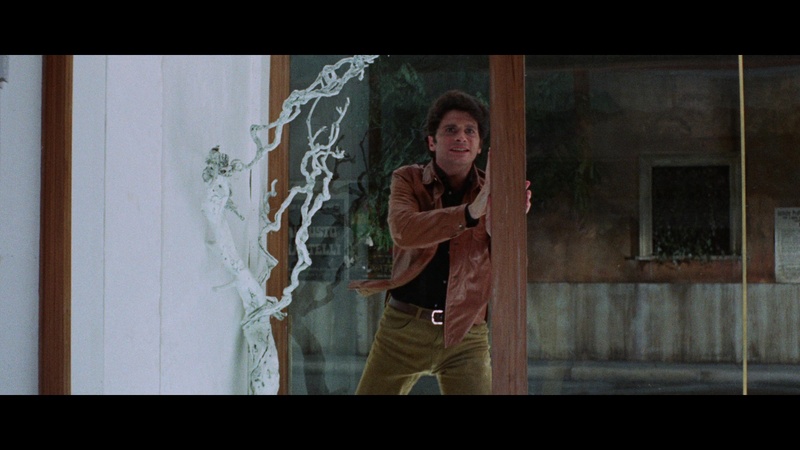 The feature also contains an entertaining audio commentary with entertaining Argento expert Alan Jones, paired up this time with writer Kim Newman; it's brisk and packed with information, including a solid survey of the Italian film scene at the time and how Argento managed to shake up the international film world his first time out. Also included are the standard international trailer, a subtitled version of the Italian trailer (previously available on the UK DVD), and two 30-second TV spots. 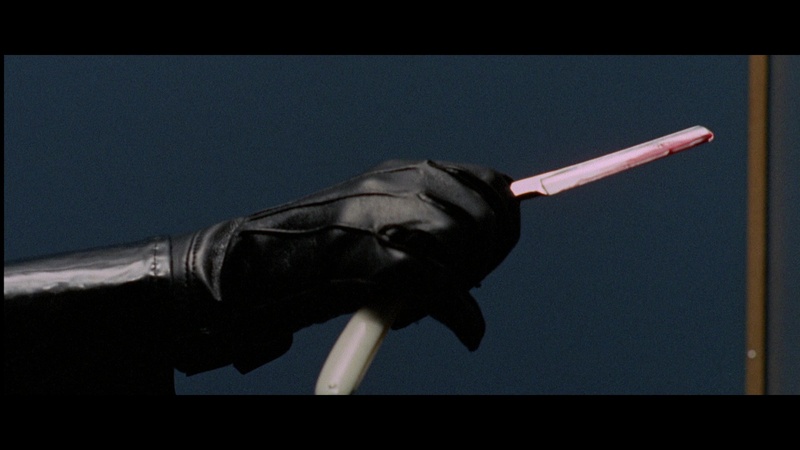 (For some reason the readily available Phantom of Terror reissue trailer has yet to appear on any official release.) Note that the DVD also promises "recently discovered never-before-seen footage of explicit violence," which refers to a few extra frames at the start of the stairwell slashing. Also on hand are four featurettes: "Out of the Shadows" (a 17m56s interview with Argento in which he talks about landing his first directorial gig), "Painting with Darkness" (a frustratingly oblique 10-minute ramble from cinematographer Vittorio Storaro), "The Music of Murder" (8 minutes with Ennio Morricone discussing his creation of "audacious, jarring and traumatic music"), and "Eva's Talking," an 11-minute chat in English with the late Eva Renzi, complete with a marvelous shot of Argento in costume doubling as the killer. She has warm memories of Argento and, well, less than flattering ones of Musante (which is the director's opinion as well). And be sure to stick around through the credits for her comments about Klaus Kinski... You can see a comparison between those four significant international releases by clicking here. The film's rocky UK video history continued with its Blu-ray bow in that country from Arrow Video in 2011, which touted a "restoration of the film from the original negative presented in Director of Photography, Vittorio Storaro's original 2:1 Univisium aspect ratio." Anyone familiar with Storaro's butchery of his compositions on his approved transfers of such scope titles as Apocalypse Now and The Last Emperor knows how disastrous the results were with awkward cropping marring countless classic images, and that trend continues here with an unwatchable hacking down of the film's compositions which have now also been doused with an ugly teal tint to add insult to injury. 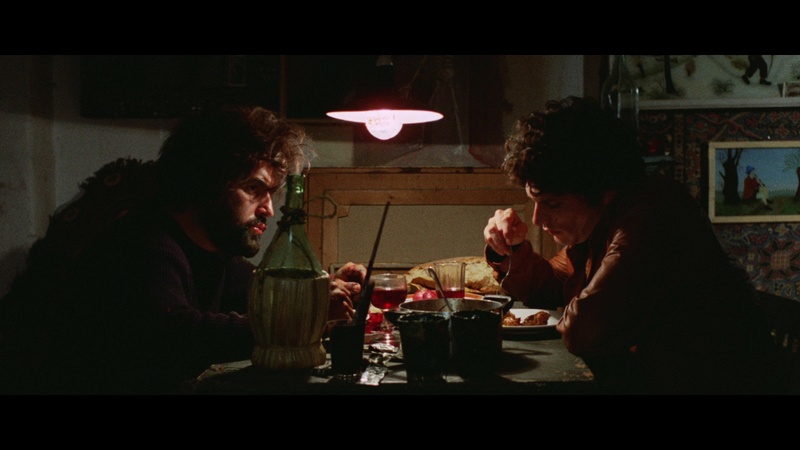 For what it's worth, that release also has a trio of featurettes -- "A Crystal Classic: Luigi Cozzi Remembers Dario's Bloody Bird" (15 mins. ), "Sergio Martino: The Genesis of the Giallo" (29 mins., which has little to do with the film at hand), and a 15-minute Argento interview, "The Italian Hitchcock," plus liner notes by the always welcome Alan Jones. When the rights with Blue Underground lapsed, a stripped-down Blu-ray was later reissued from VCI in 2013 featuring a lesser encode of the same source. Fortunately that prior Arrow edition was rendered obsolete with the company's revisit in 2017 in both the US and UK as a dual-format Blu-ray and DVD limited edition, which wisely pretends that prior release never happened. Here we have a dazzling new, exclusive 4K transfer that features a wonderfully textured and vividly colorful presentation of the film. Film grain is rich and natural throughout with a terrific sense of depth, and the generous and adept compression job results in a very pleasing viewing experience throughout. It contains more information in the frame (apart from the opticals of the opening titles), especially on the left and right, and looks a bit darker with more carefully modulated whites than its predecessors, though the Blue Underground (really the only other worthwhile release out there) is worth keeping for Argentophiles who might enjoy the brighter look. The slight image squeeze visible on actors' faces is also gone here; compare the Arrow frame grabs in the body of this review to the ones at the bottom of the page. The artificial remixes have been dispensed with here in favor of the original English or Italian language options (with optional English SDH or English translated subtitles respectively) in DTS-HD MA mono. It's worth noting that the "Right, bring in the perverts line" is back complete and intact at last as well for the first time in decades, and via seamless branching you can watch the film with its English or Italian opening and closing titles as well. The film can also be played with a very informative and fast-paced audio commentary by So Deadly, So Perverse author Troy Howarth, who has a lot of fun touring through the history of this film from its Screaming Mimi/Bertolucci origins through the various casting choices and contributions of such participants as Morricone and editor Franco Fraticelli. 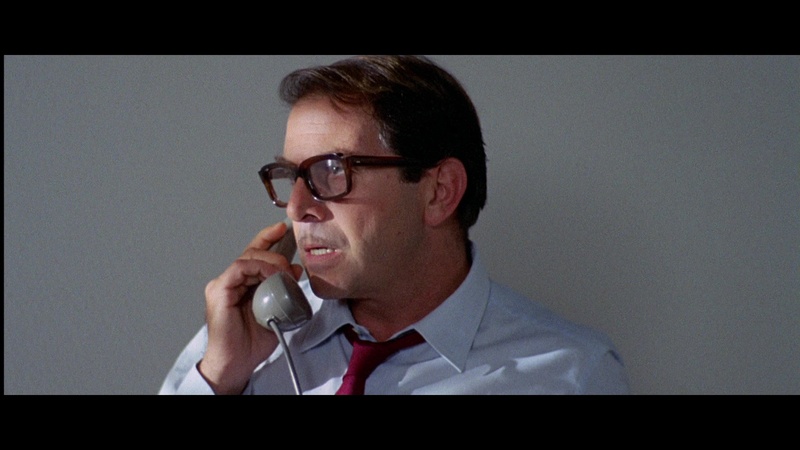 He also plays a game of "spot the J&B" throughout the film and manages to link it (twice!) to Frankenstein 1980, of all things. Pour some J&B and kick back with this one. The international and Italian trailers are carried over here (in nice new transfers) along with the "Eva's Talking" featurette, with a new, brief (55-second) 2017 Texas Frightmare trailer added as well. Now, on the new featurettes. 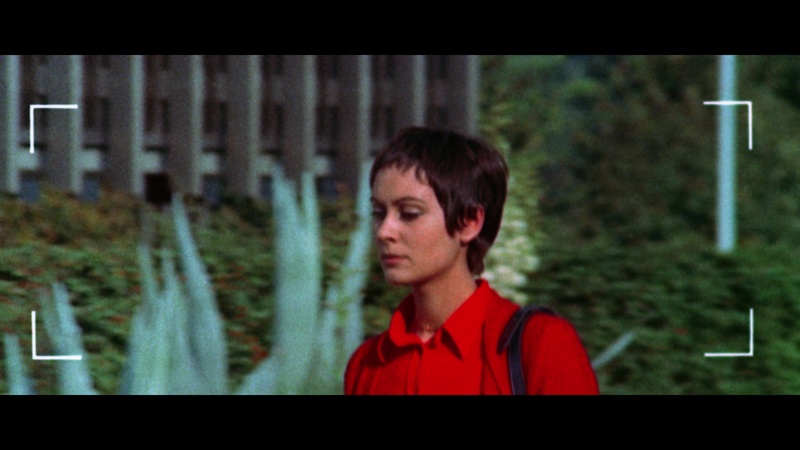 In "Black Gloves and Screaming Mimis" (31m54s), Kat Ellinger tackles the film's radically altered appropriations from Frederic Brown's mystery novel The Screaming Mimi and its placement within the Italian giallo cycle, including its use of voyeurism and fetishism to create a commercially viable (and hugely influential) production. In "The Power of Perception" (20m57s), Alexandra Heller-Nicholas tackles the larger theme of subjectivity and perception from a more scholarly angle with a video essay breaking down the complex methods of reading the portrayals of murder and femininity in Argento's films. (Needless to say, without any spoilers, this one throws quite a few wrenches into the usual "male gaze" readings of gialli and horror films in general.) The new Argento interview "Crystal Nightmare" (31m24s) produced by Freak-o-Rama covers a bit of familiar material (including the director's more recent admissions of using the Brown novel as inspiration, along with a trip to Tunisia) while offering some personal recollections about its status as his debut film made possible with the involvement of his producer father. He also offers the most thorough explanation to date for the film's title, which proved to be just as widely imitated as the film itself. In the most unexpected of the new featurettes, "An Argento Icon" (22m5s), actor Gildo Di Marco -- who has a scene-stealing bit in this film as the stuttering Garullo the pimp and also played an abused mailman in Four Flies on Grey Velvet -- tells his fascinating life story in and out of the film business, which encompasses an earthquake rescue, Terence Hill and Bud Spencer, his "peculiar" appearance in the "The Tram" (the best episode of Argento's thriller anthology TV series Door into Darkness), and his thoughts on the levels of bloodshed between his two Argento projects. The package comes with reversible sleeve options (original poster art or a new design by Candice Tripp) and an insert booklet (illustrated by Matthew Griffin) with new essays by Michael Mackenzie, Howard Hughes and Jack Seabrook. Updated review on June 14, 2017.